Originally built for the 1996 Olympic Games in Atlanta, Turner Field was converted after the event to serve as the home of major league baseball team the Atlanta Braves. 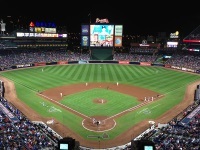 Affectionately known as 'The Ted', the open-air stadium is a great place to spend a hot summer night in Atlanta. The stadium is also home to the Ivan Allen Jr. Braves Museum and Hall of Fame, with exhibits on famous Braves players like Greg Maddux, Bobby Cox, and Hank Aaron, as well as Braves owner and stadium namesake, Ted Turner. Admission: Game tickets start at $7, museum admission is $5 ($2 on game days). Concessions available.